If you have anything to design, and I think you do, you’ll want this book. 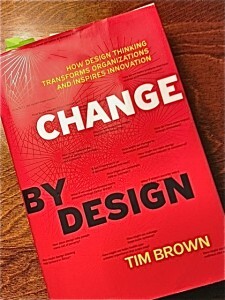 Tim Brown’s Change by Design is about the power of “Design Thinking.” That’s the methodology used many designers, including IDEO, one of the world’s best design firms. IDEO designed many things for Apple, including their first mouse. And they’ve designed hundreds of other things, from shopping carts to hospital wings. Human-Centered Design. For inspiration watch IDEO’s founder David Kelley interviewed by Charlie Rose on 60 Minutes. Kelley’s work evolved from design to design thinking. He set up the D School at Stanford that’s focused on human-centered design. Bonus: watch the behind-the-scenes video, too. The interview gives a sense of the history of the group, and looks at their prototyping space. The SPARC laboratory is a design studio embedded in a clinical hospital (the former urology department, to be precise) in which designers, business strategists, medical and health professionals, and patients work I close proximity to develop ideas for improving the patient-provider experience. It operates in part like an experimental clinic, in part like an independent design consultancy for other units in the hospital. Half a dozen projects are going on at SPARC at any given time—from rethinking the traditional examination room to prototyping the interface of an electronic check-in kiosk. The work of SPARC staff and affiliates seems destined to transform the patient experience throughout the institution. Begin at the beginning. That means divergence: in the divergent stage a group want to create many choices and options. Brown quotes Linus Pauling: “To have a good idea, you must first have lots of ideas.” Sometimes our tendency is to limit the number of ideas on the front end to be more efficient, he says. But that’s short sighted. Find talent any way you can. Brown says every organization has design thinkers, you just have to find them and free them up. Also bring in folks from the outside. Design for the cycle. Most projects take time, so be flexible with the team. Let them stick with it. An interview with Tim Brown speaking on design thinking on WNYC radio here.